Explaining the MiG-35’s setbacks by citing the fact that it is not mass-produced is a stretch. Although the Dassault Rafale fighter is currently being mass-produced, it had failed to win all recent tenders. Anatoly Isaikin, head of Rosoboronexport, Russia’s state arms exporter, was once again forced to address the string of setbacks plaguing Russian arms manufacturers in India over the past 12 months. This includes the long-suffering Mikoyan-Gurevich MiG-35 fighter, whose future on the domestic and foreign markets remains unclear. “The situation with these tenders has nothing to do with any systemic problems,” Isaikin told the Vedomosti newspaper. “To my mind, the MiG-35 fighter plane has lost the tender in India because it was not mass-produced. At the same time, French and U.S. companies were able to submit their production versions,” Isaikin added. Some time ago, India announced its Medium Multi-Role Combat Aircraft (MMRCA) tender for the purchase of 126 multi-role medium fighters, which should completely replace the rundown MiG-21 Fishbed fighter planes used by the Indian Air Force. The tender involved the United States with its Lockheed Martin F-16IN Super Viper and Boeing F/A-18E/F Super Hornet fighter planes; France with its Dassault Rafale fighter; the European Aeronautic Defense and Space Company (EADS) with its Eurofighter Typhoon; Sweden with its Saab JAS-39NG Gripen fighter plane; and Russia with its Mikoyan-Gurevich MiG-35 Fulcrum-F fighter. The tender’s results were announced in the winter of 2012, with the contract going to Dassault Rafale. Initial deliveries were estimated at almost $11 billion. It’s not for nothing that the media referred to this as “the mother of all tenders”. Having opted for Dassault Rafale, India will not be able to buy the 126 warplanes for this sum. Analysts note that either purchasing volumes will have to go down or the contract’s end price will reach $16-18 billion. Explaining the MiG-35’s setbacks by citing the fact that it is not mass-produced is a stretch. Although the Dassault Rafale fighter is currently being mass-produced, it had failed to win all recent tenders. It has only flown with the French Air Force pending the results of the MMRCA tender. Leaving aside for the moment the Indian principles of diversifying supplies and striking balance among the main market investors, which are regarded as sacred and indisputable by Indian generals, let’s assume that this Russian-made fixed-wing aircraft fits into the concept guiding New Delhi’s military contracts. In its time, India had ordered two virtually non-production warplanes from Russia – first, the Sukhoi Su-30K Flanker-C and then the Su-30MKI Flanker-H. Both fighters eventually struck gold during Russian military aircraft exports. In the mid-2000s, New Delhi ordered the revamped MiG-29K Fulcrum-D carrier-borne fighter. It is hard to argue with the fact that aircraft production runs and the popularity of specific warplanes with the manufacturing country’s air force influence the choice of clients during the purchase of foreign weapons systems. As for the MiG-35, its specifications and performance, rather than its production run, are the main problems. The MiG-35 is a descendant of the above-mentioned MiG-29K in many respects. India had no qualms about buying the MiG-29K. In fact, the Indian Navy has ordered 45 of these fighters to date. Of this number, 16 MiG-29Ks have already been shipped to India. At any rate, the production MiG-29K is not as good as the well-known Su-30MKI, which is quite popular in India. However, the MiG-35 has been and remains substandard. The three MiG-35s being used for demonstration purposes are, in fact, a “flying offer” for prospective clients who must submit a request for proposal (RFP) in line with specific objectives. Under the state arms procurement program through 2020, the Russian Air Force is to buy an estimated 50 MiG-35 fighter planes or so. However, the specifications and performance of the domestic fighter, due to be adopted by the country’s air force, have not been clarified to date. The previous high command of the Russian Air Force was leery of the very idea of buying these warplanes and the possible modernization of operational MiG-29s. So far there is no reason to believe that the new Air Force commanders will drastically change their approach. Some analysts openly claim that the fighter has no future. They believe that the MiG-35 is quite expensive, that it has numerous drawbacks and an unclear tactical designation. Moreover, prospects for its production remain vague against the backdrop of the brilliant T-10 fighter family, including the Su-30MKI/MK2 and the Su-35 Flanker-E, whose production poses no problems whatsoever. 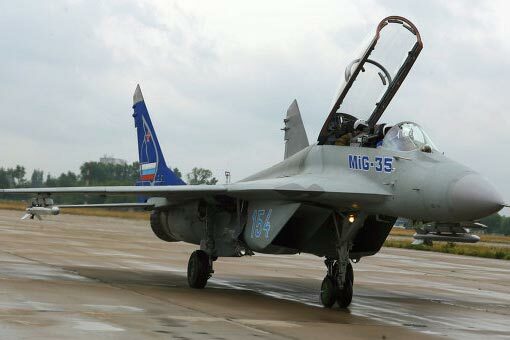 Other analysts believe that the MiG-35 has export potential but add that the Russian Aircraft Corporation MiG should build some of these aircraft for the country’s air force. For its part, the Russian Air Force faces numerous internal problems, and support for national exports is not among its priorities. All this does not amount to mistakes and failures on the part of Rosoboronexport, the Federal Service for Military Technical Cooperation or the aircraft industry. The unique fates of “non-production” export aircraft, including their unexpected successes and setbacks, are a consequence of the Russian defense industry’s growth model, which had evolved by the late 1990s, and which continues to influence the situation. For 20 years, the state did not award major long-term contracts for the delivery of military products. The Soviet defense industry had existed as a highly specialized state within a state, even if its enterprises sometimes had to turn out civilian products. Devoid of contracts, since 1992 entire industries were unable to manufacture weapons systems and other military products. Consequently, they lost their competitive advantages and proved unable to implement modernization programs. Exports proved to be the only source of revenues. But this implied the frugal reinvestment of the profits obtained, as well as cost-effective corporate governance and management. Some enterprises were able to assess market trends and to sell the most popular Soviet technologies following the break-up of the USSR. By so doing they managed to preserve their R&D and production potential without suffering any major setbacks. One can therefore disagree with Anatoly Isaikin because this is a system-wide problem. However, this problem has nothing to do with the work of Rosoboronexport, which should not tackle such issues as industry development strategies or those of specific arms production facilities. Currently, the government is trying to move away from the defense industry’s export-oriented funding model and to award more domestic contracts. This process has just been launched. The most cost-effective industries, including tactical aircraft or helicopter enterprises, signed major contracts two or three years ago, and the first products are being delivered to the Russian Armed Forces. However, all other enterprises will have to boost their production until 2020, the final deadline for implementing the state arms procurement program. This will at least partially eliminate the need for a nerve-racking search for foreign clients wishing to buy substandard products. Such products are subsequently upgraded with the help of advance payments and loans for future projects. However, it is foreign clients who dictate the relevant policies in such cases. Setbacks seem inevitable in such situations. The concerned parties try to provide for such setbacks in any state defense contract just to compensate for the losses incurred. Well-balanced and regular funding from diversified sources, including real-life defense industry conversion, will make it possible to calmly implement current and future R&D projects, making full use of Russia’s remaining engineering potential.